The National Institute for Fusion Science (NIFS), of the National Institutes of Natural Sciences (NINS) in Japan, has achieved an electrical current of 100,000 amperes, which is by far the highest in the world, by using the new idea of assembling the state-of-the-art yttrium-based high-temperature superconducting tapes to fabricate a large-scale magnet conductor. NIFS is undertaking the development of a high-temperature superconducting coil that is appropriate for the fusion reactor magnet. Using the state-of-the-art yttrium-based high-temperature superconducting tapes which have been developed and produced in Japan through the new thinking that simply stacks the tapes, NIFS manufactured a conductor of exceptional mechanical strength. For the conductor joints, which are important for the production of the large-scale coils, NIFS developed low-resistance joint technology through collaborative research with Tohoku University. As a result of the prototype conductor test, at the absolute temperature of 20 degrees Kelvin (minus 253 degrees Celsius) the electrical current exceeds 100,000 amperes. The overall current density exceeds 40 A/mm2 including the jackets, and this value is of practical use for manufacturing large-scale fusion reactor magnets. This result is of global importance. We use 54 yttrium-based high-temperature superconducting tapes. Each tape is 10 mm in width and 0.2 mm in thickness. The electrical current flows only through one area. Together with the substrate used for this type of tape that is exceptional in strength and flexibility, by surrounding this area by a copper jacket and a stainless steel jacket an extremely strong conductor is produced. The current is induced by magnetic induction. 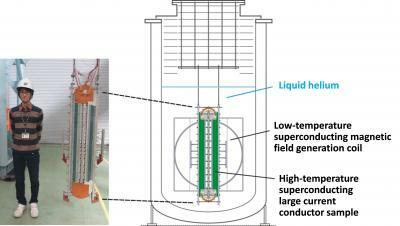 The revolutionary method by which the helical fusion reactor's massive magnet is manufactured by sequentially connecting the short high-temperature superconductors has received much attention. 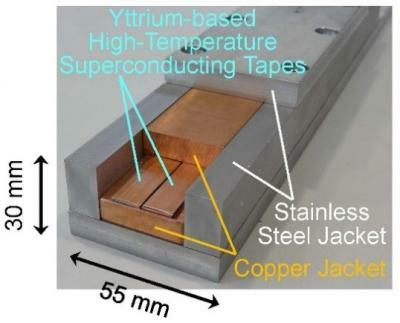 Further, the large current-capacity high-temperature superconductor with simple stacking of yttrium-based tapes and the so-called "joint winding method" have also impacted the development of high-temperature superconducting magnets used in medical instruments and power-electric devices. Ripple effects are anticipated in the future.